It appears the Google search spam team has a busy year planned. Matt Cutts recently attended SMX west and gave details on what updates they have planned for 2013. And guess what? There will be an update of both Google Panda and Penguin this year. Surprised? Probably not. Google's updating their algorithm all the time -- some updates bigger than others, of course. What's the result? An unnerving feeling that your SEO standard operating procedures aren't totally up to date, because you're not sure if you are totally up to date on all the algorithm changes. Since that first update, Google went on to release a further 23 updates, with the latest happening on January 22nd of this year. The update this weekend is the last manual update of Google Panda, as Google is planning on making it part of its overall continuous algorithm. What the heck does that mean? It means good news for webmasters, as forthcoming refreshes to the update will be less intense, and by extension less noticeable to marketers. So going forward, Panda updates really won't rock your world like they might have been the past couple years. One of Panda’s core targets for penalization is websites that have little in the way of original content. Instead, they have lots of pages that are nothing more than advertisements and links, kinda like this (image courtesy of SEOmoz), or content clearly purchased for low cost through what is often called a "content farm." Websites with shallow content aren't helpful to searchers, so as a company trying to promote the best search experience possible, it makes sense that Google is trying to ensure only the best content is surfaced in the SERPs. There are a number of reasons a website can end up with internal duplication of pages. URL parameters like session IDs can result in a site having a lot pages that are identical. Or webmasters may just be trying to win in the SERPs through a little trickery instead of good old fashioned elbow grease. Either way, the internal duplication targeted by Panda was focused on sites that duplicated pages to target multiple keyword variations. For example, consider a site trying to rank for hotels in London. They may create a number of identical pages to target one keyword per page. The below pages, then, may be completely identical, any just target different keyword variations of "london hotels." 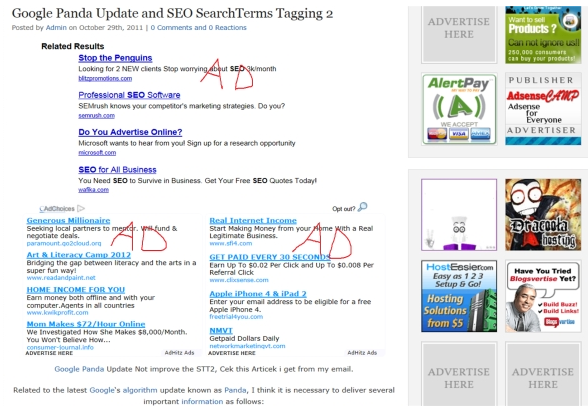 Websites with a high ratio of ads above the fold were another target for Panda. If a user lands on a web page and has to scroll down before they get to read any content, there is a good chance that site may be a candidate for some Panda wrath. There are a number of reasons a website can end up with a lot of empty web pages -- from the internal search functionality to just general housekeeping issues. This is another factor that could put your website at risk for Panda penalties, and one that a dedicated technical SEO specialist, whether in-house or through an agency, can help alleviate. If you're buying your inbound links, you're a prime target for a Panda punch. This is one of those tactics that rewarded those with the most money, not the best content, in the SERPs. I think most people have given up this practice, or those that haven't are easily identified by Google and duly punished for their shady ways, but if there are any stragglers out there, remember this is decidedly black hat SEO. These are the major Panda updates it's important marketers are aware of. There are some other ones -- positive ones, like stronger incorporation of social sharing in the algorithm's weight, for instance. These five highlighted here are the updates that are the most likely to negatively affect your SEO if you haven't already remedied these issues. Since Panda first raised its ugly head, there has been a lot of data released that can help websites recover from Panda and ensure they're not impacted by future updates. Here are some of the most critical tips to keep in mind to ensure you're as prepared as you can be for the unknowable. If you're not using ads at all on your site, congratulations, you're all set. Move on to the next tip. If you're using ads on your site, and your site template has a high portion of ads above the fold, consider moving to a design that makes use of ads a little more intelligently. 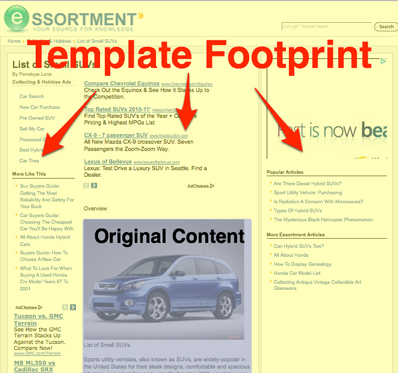 The content on a page is the reason a person has visited your site; make sure it’s easily accessible. If your site is relatively large and has some complex functionality, there is always a possibility you could end up with some empty pages and issues that could affect the overall quality of your site. Implement a regular SEO audit that will provide a sanity check for your website. Look for things like empty pages, broken links, or internal duplication of pages caused by parameters, and make use of 301 redirects and the canonical tag to cure your website of these problems. If all of this makes your brain hurt or causes you to run for cover in your colleague's cubicle, bring on a technical SEO specialist, whether in-house or through an agency. You need to determine if the content you're publishing is actually adding value to your visitors. Remember, hitting a certain keyword density is not the name of the SEO game these days. Measure your content against some key metrics, like number of page views, number of organic visits, number of inbound links, and number of social interactions. If people are finding your content relevant and useful, as indicated by page views, links, and shares, chances are you should be safe from Panda. Google is always looking to penalize websites that use shortcuts to attain their rankings. It's not because they're out to get you. It's because usually, those shortcuts compromise the quality of the Google search experience by gaming the rankings in such a manner that low quality sites get ranked above the ones that are 1) actually doing the work, and 2) actually worth reading. Not cool, sketchy webmasters, not cool. Recently, for instance, they just took out a whole Russian link network. Never put your business at risk by implementing any kind of SEO practice that seems a little too good to be true; because usually, it is. Focus on producing content that your target buyer personas will find useful. Google Panda is a site-wide penalty, which means a few poor quality pages can get your whole site penalized. Although it's possible to recover, it's easier to just avoid the problem in the first place. Make sure you're putting a lot more focus around the content you produce and be completely focused on adding value for your audience. Whatever the last manual update of Google Panda has in store, following the tips above will help you stay clear of any negative impact going forward. 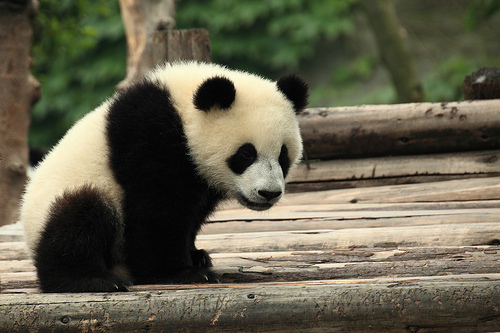 What do you think the Google Panda algorithm update has in store? Is your site Panda-friendly, or are you still trying to catch up with all of the updates?